The Met Office and the Centre for Ecology & Hydrology recently published a report on the recent storms and floods in the UK. The report documents the record-breaking weather and flooding, considers the potential drivers and discusses whether climate change contributed to the severity of the weather and its impacts. CEH’s input to the report relates to the major flooding that has been experienced in many areas of the country over the last eight weeks. With catchments across most of the UK saturated by mid-December, the full gamut of flood manifestations – tidal, pluvial (flash), fluvial and groundwater – has been experienced over the ensuing seven to eight weeks. Estimated outflows (total river flows) from Great Britain remained close to the highest ever recorded during late December and, subsequently, throughout most of January across large parts of England and Wales. The cluster of drought and flood events through the early years of the 21st century and the recent runoff and recharge patterns, are near to the extreme range of historical variability, and therefore also raise the question that they may reflect anthropogenic climate change. It is important to note, however, that differing flood types may be expected to respond differently to increasing temperatures. Tidal flood risk is increasing as sea levels rise but the outlook is more complex in relation to fluvial flooding. As yet, there is no definitive answer on the possible contribution of climate change in the recent storminess, rainfall amounts and the consequent flooding. This is in part due to the highly variable nature of UK weather and climate. The floodplain inundations have caused major disruption to transport, agriculture and restricted sporting and recreational activities, and resulted in severe difficulties for some low-lying hamlets (most notably in the Somerset Levels). However, given the overall volume of runoff, the amount of property flooding at the national scale to date, has been relatively modest; a tribute to the general effectiveness of flood defences. During the last two months, In a series from 1883, flow rates on the River Thames have remained exceptionally high for longer than in any previous flood episode. Correspondingly, floodplain inundations on the Thames and in many other areas have been extensive and protracted. A preliminary analysis suggest that outflows (total river flows) for the River Thames at Kingston aggregated over six weeks were the greatest since the 1947 floods. The 1947 event was the most extensive in England & Wales during the 20th century. Generally, however, the peak flows registered during the recent flooding were not extreme. On the River Thames the highest flow in 2014 (up to end January 2014) has been exceeded during 14 earlier floods (most prior to 1950). 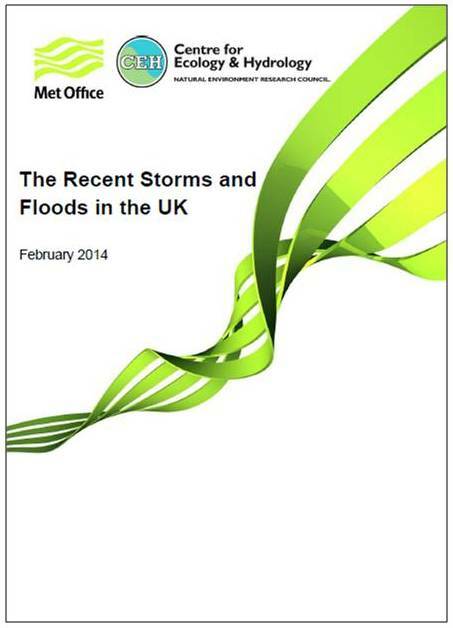 Download a copy of the The Recent Storms and Floods in the UK. Media enquiries related to the hydrological analysis report should be directed to the CEH Press Office. Our scientists can provide explanation and analysis of historic hydrological patterns, possible future scenarios under climate change and scientific understanding of the current situation. We are not able to comment on immediate operational issues. The Met Office sumary of the report can be found on their website here. The Centre for Ecology & Hydrology jointly operates the National Hydrological Monitoring Programme (for the UK) in conjunction with the British Geological Survey. NHMP scientists produce the UK Monthly Hydrological Summary which assesses rainfall, river flows, groundwater and reservoir levels. They also operate the UK’s National River Flow Archive. The NHMP also has a remit to analyse major flood and drought events in the UK and analyse long-term trends in UK hydrological data. The team publish a series of occasional reports on major hydrological events, including reports on the UK’s major flood events in 2000/2001, 2007 and 2012. The UK’s Monthly Hydrological Summary is published on, or before, the tenth working day of the following month. A Hydrological Outlook for the UK is also available. In 2012 CEH staff concluded a major project looking at “Future Flows and Groundwater Levels: British projections for the 21st century“. The research looked at the impact of climate change on river flows and groundwater levels across England, Wales and Scotland and produced two unique datasets, which are now available via the CEH website, through the CEH Information Gateway and downloadable from the National River Flow Archive and National Groundwater Archive. This entry was posted in National News and tagged Climate Change, extreme weather, flood research - Rainfall, floods and storms, the Centre for Ecology & Hydrology, The Met Office, The Recent Storms and Floods in the UK., UK floods and the potential impacts of climate change? by tamesidegreens. Bookmark the permalink.